EAST PALO ALTO, Calif. (CNS) — Josue Barbosa Zamora died in a drive-by shooting Jan. 13, 300 feet from his front door, the latest young man to die violently in East Palo Alto. “Every day I ask myself if it was worth it. We escaped from Mexico because of the violence and poverty and now we found this,” said Lorena Zamora, who left her husband behind 10 years ago to bring her three children to the U.S.
Zamora spoke in Spanish to photographer Jose Aguirre of Catholic San Francisco, the archdiocesan newspaper. Lorena Zamora mother joined other grieving mothers, San Francisco Auxiliary Bishop William J. Justice, community members, and parishioners and the priests of St. Francis of Assisi to walk her neighborhood for peace, praying the Stations of the Cross March 8. In 2013, there were 16 homicides in San Mateo County, eight of those in East Palo Alto, a city with a population of fewer than 30,000 people. While the city’s murder rate is down from the 42 recorded in 1992 when it gained notoriety for the highest murder rate in the nation with a population then of 24,000, it continues to suffer from festering gang wars and the drug trade. Several hundred people, many mothers pushing strollers, youngsters from Saturday catechism and their parents, as well as grandmothers and grandfathers, prayed and sang in a procession to the street-side shrine near where 19-year-old Josue Zamora died. Several men parishioners took turns carrying the heavy wooden cross, in imitation of Christ’s journey to Calvary. Bishop Justice led the group in praying the 14 Stations of the Cross. A group of Tongan men, the St. Francis Boys who play at two Sunday Masses, improvised an original song, “I Cry for Peace.” Their equipment was set up in a driveway next to the flowers, pictures, candles and a Buzz Lightyear plastic plate that comprised Zamora’s shrine. “In a moment of silence, let us remember those who have died, the youth of our city,” prayed Bishop Justice, as the mid-morning sun beat down. Parishioners of St. Francis of Assisi traditionally enact the outdoor Stations of the Cross each Friday in Lent. This year, in collaboration with the archdiocesan restorative justice ministry led by Julio Escobar, they began with a peace walk. “Lent is a time of joining with Christ in his suffering and death,” said Father Lawrence Goode, pastor of St. Francis of Assisi. For the 10 years he has been pastor, Father Goode also has been praying with the San Mateo St. Vincent de Paul Society many times of year, as the Society of St. Vincent de Paul holds a prayer vigil at each murder site. 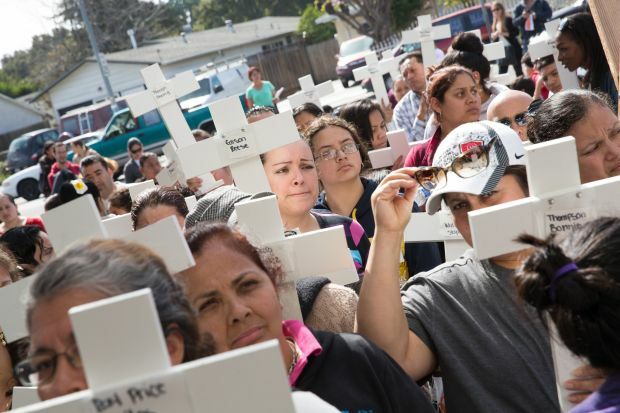 East Palo Alto is plagued by gang violence stemming from the drug trade, and Father Goode said there is so much fear that the perpetrators rarely are punished, and the “foot soldiers” not the drug users or big dealers are the only ones incarcerated or shot. East Palo Alto Police Sgt. Jeff Liu, speaking at the rally, urged people to use the anonymous tip line to help police, but Father Goode said people are even afraid to give information anonymously. “It is time to stand up,” Wilson said.